1. Chop 4 of the onion wedges. Combine marinade ingredients and chopped onion in small bowl. Place beef steak and marinade in food-safe plastic bag; turn steak to coat. Close bag securely and marinate in refrigerator 6 hrs. or as long as overnight, turning occasionally. 2. Thread remaining 12 onion wedges onto two 12-in. metal skewers. 3. Remove steak from marinade; discard marinade. 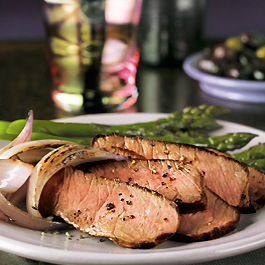 Place steak in center of grid over medium, ash-covered coals; arrange onion kabobs and asparagus on grid around steak. Grill steak, uncovered, 16 to 18 min. (over medium heat on preheated gas grill, covered, 16 to 19 min.) for medium rare (145°F) to medium (160°F) doneness, turning occasionally. Grill onion wedges, covered, 15 to 20 min., turning occasionally. (Gas grilling times remain the same. ); grill asparagus 6 to 10 min. (covered, 8 to 12 min. on gas grill) or until crisp-tender, turning occasionally. 4. Remove onions from skewers. Toss onions and asparagus with 3 Tbsp. vinaigrette. Carve steak crosswise into thin slices. Season with salt and pepper, as desired. Serve with vegetables. * Cook’s Tip: To make asparagus spears easier to turn on the grill, thread them ladder-style onto two 12-inch metal skewers. Insert a skewer about 1 inch from each end of the asparagus spear, leaving small space between spears. Use tongs to turn entire asparagus “ladder” for even cooking.